We read Till We Have Faces, by C.S. Lewis for DJ and Casey’s Sonlight curriculum. I must say that I truly disliked the book. Granted, my beloved author was simply rewriting a previous work on Psyche and Cupid, but I am still unsure and unconvinced of the Christian moral that he was trying to elicit from this legend. It could be that I am just incapable of thinking that ‘deeply’, and that in my ignorance I totally missed the point. After all, it is his children’s books that I love, which hold all of the hidden symbols of Christ and the Bible, that are simpler to understand. Once upon a time there was a little girl who was walking up and down the streets of London on Christmas Eve night. She was rather homely looking, dressed in a patchwork dress that was covered in soot, her hair was tangled, and she had holey socks on her feet. She was tirelessly trudging through the snow, asking for coins, and looking very out of place amidst the happy villagers and bright, merry stores. Eventually, she came to an alleyway, and slipped in, as the Scotland Yard didn’t like the street urchins sitting on public benches. She had learned that lesson the hard way, as they had picked her up from a public bench, carried her to the alleyway, and whipped her thrice on her back. As she sat there, leaning against the cold, hard brick wall, her mind wandered back to a time when she was happy. She began thinking of her parents, and the big warm manor they had lived in. On those Christmas mornings, the servants would help her into fine, pretty dresses, and she would run down the grand staircase and into the banquet hall, where her mother and father would be sitting beside their elegant tree. At the time, she never cared about the presents, all she ran for was her mother’s lap, the most treasured spot in all of London to her. Shaking off the memories, the little girl shivered and pulled her knees closer to her chest. She looked to her left, and to her dismay saw the sun descending quickly past the towering buildings. Once the sun went down, the fierce cold of the night would come. Squeezing her eyes shut, she tried to remember her favorite bit of Christmas, her Papa reading the Christmas story about the birth of Jesus. Wiping away her tears, she tried to understand why God would take her parents away (they both were taken to the Lord by scarlet fever), but she continually trusted Him to provide for her safety and comfort. With renewed determination, she headed back to the streets with God on her side. She fell asleep mid-prayer, still clutching her last match stick. 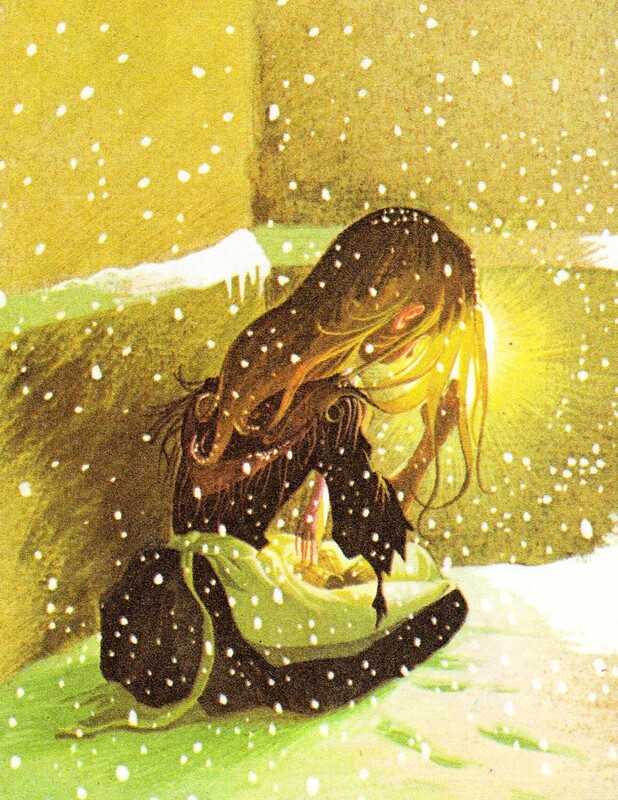 Good job Casey 🙂 She took a sad little story, that ended in the death of a starving and cold child, and gave it a happy ending………an eternal life with Jesus. Amen! Beautifully, beautifully written (or spoken aloud). Her story is much better than most out there! Thank you for sharing in a way that the Lord and His ways can be understood. Go forth and conquer!